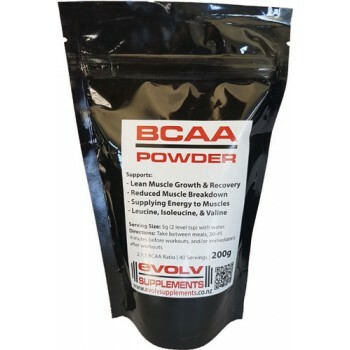 Evolv Supplements BCAA Powder contains a balance of Branched Chain Amino Acids, which are building blocks of muscle. Metabolized directly in the muscle, BCAAs may improve nitrogen retention by sparing other amino acid groups for repair and rebuilding. The Branched Chain Amino Acids (BCAA's), so named because of their unique branched chemical structure, are essential in that the body cannot make them from other compounds. In recent times, these amino acids have been investigated for their potential anticatabolic (preventing muscle breakdown) and anabolic (muscle building) effects. It´s the perfect combination of BCAAs to reduce muscle breakdown, fueling muscle development, increased lean body mass and even aiding in fat loss. In fact, it´s the ideal combo of muscle fuel without any fillers that can be found in many subpar BCAA mixes. Evolv Supplements BCAA Powder delivers 5grams of Branched Chain Amino Acids in a 2:1:1 ratio of Leucine to Isoleucine and Valine. Use it between meals, before training or post workout to augment your daily intake of amino acids for muscle support. Consume 5 grams (2 level teaspoons) with a small amount of water between meals, 30-45 minutes before workouts, and/or immediately after workouts. The very small amount of lecithin is for easier mixing. Storage: Keep sealed & in a cool dry place, out of direct sunlight.